Posted on Fri, Feb 24, 2012 : 5:50 a.m.
A good snowfall is a rare thing this winter, so we want you to help us document this one. While you're shoveling, sledding or just enjoying the winter wonderland created by Friday's snowstorm, take a few pictures and send them to us. 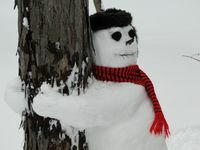 Send us a picture of your snowman, the beautiful scene outside your window or your kids playing in the snow. Do you have snow-day traditions? Whether you plan to ski, make a snowman, or enjoy some warm chocolate chip cookies inside, take a picture and share it with us. Send us photos from your snow-day by posting them on our Facebook wall, by tweeting at us (@annarborcom) or by emailing us at news@annarbor.com. We'll post the photos we receive in a gallery on the site. Fri, Feb 24, 2012 : 2:55 p.m.
My picture would be my new arctic snow boots collecting dust in my closet. Fri, Feb 24, 2012 : 1:42 p.m.
My picture would be my two-stage snow thrower sitting inside the garage, collecting more cobwebs and dust. Fri, Feb 24, 2012 : 1:41 p.m. I have a half inch of snow on my lawn. Is that a snow day? Fri, Feb 24, 2012 : 1:01 p.m.
My snow day tradition is to look out the window and see that only one inch of snow has fallen and the media hysteria/filler article festival was unjustified.